A Quiet Monday in Floyd? According to conventional wisdom, everything is closed on Monday in Floyd, Virginia. That’s true for some retail establishments and restaurants, but the Jacksonville Center was running full-tilt. 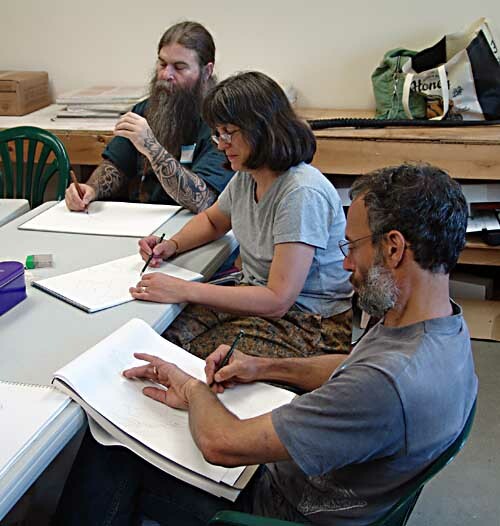 I visited two classes, Drawing for Adults and Kids which was taught by Illustrator Rick Cooley, and Intro to Wheel Throwing which was taught by McCabe Coolidge. 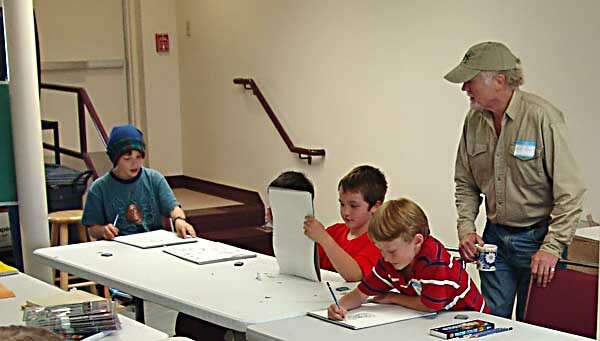 This was the first day of the Greenfire Kids Art Camp at the Jacksonville Center and the place was full of students. This is encouraging because it is their first-ever camp for kids from ages 8 to 15. 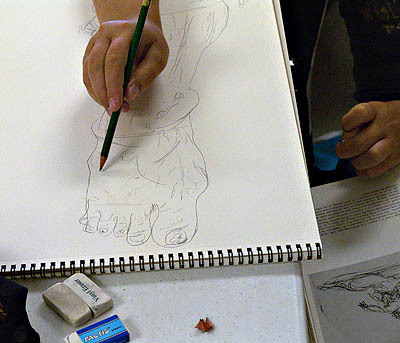 About 45 kids and a few adults are involved and all of these classes are underwritten by the Greenfire Fund, an anonymous fund for the purpose of making art accessible to under served populations. 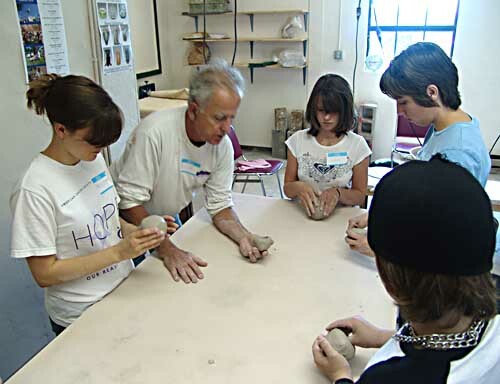 The classes cover polymer Clay, Introduction to Wheel Throwing, Drawing for Adults and Children, and Self-Portrait in Tile Mosaics. This first effort was involved primarily with young people, but the next generation in the Fall will be an inter-generational series where guardians and minors will participate together. That should be an exciting series to watch. have never seen a master blacksmith at work, you should drop by and see what these students are learning. We all rejoice when we see full classrooms at the Jacksonville Center because that means that the master craftsmen and artists who teach here are transmitting their knowledge to a new generation of up and coming artists and craftspeople. The unfortunate reality is that too many of the Jacksonville Center classes are canceled for lack of attendance, because not enough people know what is being offered! The opportunity to learn from these experts is limited and it is a huge loss when a class or workshop cannot be scheduled because enough students did not hear about it in time to sign up. I am working with Chris Shackelford of the Jascksonville Center to publish a weekly newsletter for the Craft School so that potential students can keep up with the new courses being offered. If you can’t break free to take one of these classes, tell someone else about them. 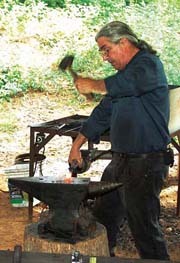 The Blacksmithing Forges are blazing at the Jacksonville Center: On June 16 &17, Master Blacksmith Jesse Ward teaches a Blacksmithing Intro Weekend. Jesse introduces her students to the thrill of making things with iron and routinely gets them to make things they didn’t know were possible. There are seven more Blacksmithing Courses following this one, so there is no reason for you to miss out this summer. Acquire a skill that will serve you for years to come. More Pottery Classes are coming up fast: Martha Sullivan will be teaching Functional Pottery from the Wheel June 18-22. This one week course will have you creating usable objects for the table such as bowls, mugs, and lidded objects. Jayn Avery will be teaching hand building techniques for creating functional pottery by hand using tools and props that can be found in almost any kitchen. Make bread pans, serving plates, ladles, gravy boats. The Glassworking Studio is heating Up: Ed and Martha Biggar will show students how to create beads that stand together as your personal "totem". This involves Soft glass flameworking which allows a student to create complex designs using techniques such as dotting, masking, raking, and adding on. 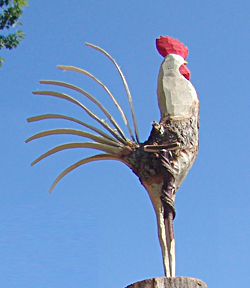 Old Time Whittling is Back: Brad Smith, whose whimsical roosters are seen in several galleries, will be teaching carving of useful and decorative folk art projects. Check out the Jacksonville Center website. This entry was posted in Seen around Floyd and tagged Brad Smith, Chris Shackelford, Ed Biggar, Elmer Roush, Greenfire Fund, Jacksonville Center for the Arts, Jayn Avery, Jesse Ward, Martha Biggar, Martha Sullivan, McCabe Coolidge, Polymer Clay, Pottery Classes, Rick Cooley, Whittling. Bookmark the permalink. 0 Responses to A Quiet Monday in Floyd? Like we discussed on the phone, I was so pleased with the “Jacksonville folks” on Saturday when they allowed me to join in on a blacksmithing class. As new as I was, they were very accommodating and I learned a lot. I even got to take home my “project”, which I’m sure you would find impressive!! The hourly rate for the class was certainly reasonable, considering all I got out of it. Looks like Chris S. will still have to work on my “decorative piece” for the house, but who’s to say I couldn’t do it on my own, given about 5 or so years?